MAGICAL MELODY: Volcanoes Active Around the World! Volcanoes Active Around the World! Volcanic Update: Mount St. Helens Update, October 7, 2004, 6:15 p.m., PDT -Current status is Volcano Advisory (Alert Level 2); aviation color code ORANGE. In Rinjani, Indonesia: Tremor quakes were registered since 23, 24, 25 and 26 September 2004, in number of 6-36 per day with range of amplitude between 12 mm - 14 mm, duration between 94 - 1450 mm. Based on increasing of hazards at Rinjani after explosion, the authorities have risen the Alert level to III (Orange) since 1 October 2004 at 06.00 WITA. Mount St. Helens has temporarily calmed down, but I feel lots of earth activity. Over the past couple of weeks it's been intense as I have not felt this much energy symptomology in my body and psyche relative to the earth in years. The rains here in NZ have been heavy over the past couple of days now! I have been feeling lots of pressure in my body and an intensity that peaks at least once per day, leaving me feeling like I want to jump right out of my skin at peak time. It happened again this evening right when I was in the middle of meditating. I then did some research to see how many volcanoes are active now and what's happening.This led me to share some history about Mt. Ruapehu in New Zealand. To see the latest volcanic updates and some history about this beautiful mountain, please visit the links provided. Besides skiing, the main attraction of Tongariro National Park are the volcanoes, Mt. Tongariro, Mt. Ngauruhoe and Mt. Ruapehu. They are situated next to each other and are spectacular to look at as they rise high above the landscape and are covered in snow in winter. Mt Ruapehu is New Zealands highest volcano reaching 2797m which also makes it the highest mountain in the North Island. Ruapehu is one af New Zealand's most active volcanoes and had some major eruptions as recently as 1995 and 1996 and an intense volcanic tremor occurred on 17th July 2000 under Mt Ruapehu volcano. Ruapehu has a single vent with a crater lake. 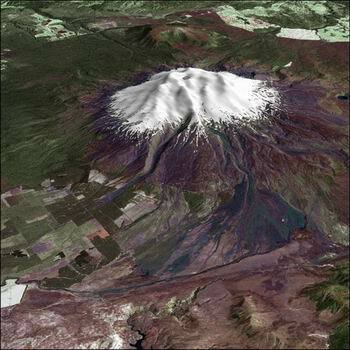 On July 8, 1996, activity at Ruapehu intensified with an eruption. One spectacular eruption produced a column that climbed rapidly to 25,000 feet 7,500 m) and threw lava blocks more than 0.6 mile (1 km) from the crater. Mt Ngauruhoe was used as Mt Doom in the blockbuster trilogy, 'Lord of the Rings'.